Pike Blog: Alive. And Kicking. I got back to the river last night, and after fearing the worst, I saw dace topping, a koi and even saw a barbel flash - but it was almost dark so I got up early(ish) this morning for a proper look. Just downstream of the pollution was a disaster with a big fish kill, the next stretch down suffered less, but I was interested in further down, where I thought less attention would be paid. Didn't take long before Dan had a wrap round bite and connected to a good fish. To say it was a great fight would be an understatement - probably 10 minutes of hard work, and netting it was no picnic either. 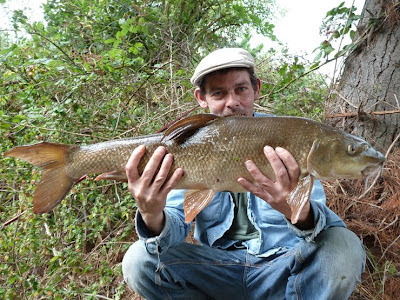 A 9lb 6oz barbel, fantastic result! I think we would have had more but a thunderstorm pushed us off the river soon after - even we aren't stupid enough to fish during lightning! And the rain is great news, diluting the pollution and washing it out of the river. I didn't manage a barbel but I did add another species to this years list with a 3lb 1oz ornamental koi. She's put on 3oz since I caught her last month, such a greedy bugger indeed, nearly quarter of a pound in around a month is brilliant that means since I had her shes been gorging, being caught hadn't put her off. nIce koi as well not seen that before! That's great, a potential double by the end of the season then. 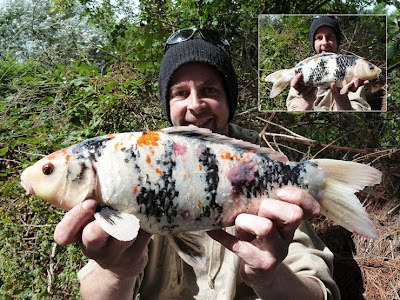 I've seen that koi in the water a few times, swimming over and ignoring my bait mostly. If nobody else has caught it I think I'll name her Kathy! It's good news that The Wandle Trust and the EA got involved quickly, I think it could have been a lot worse. Shame it happened in the first place though.